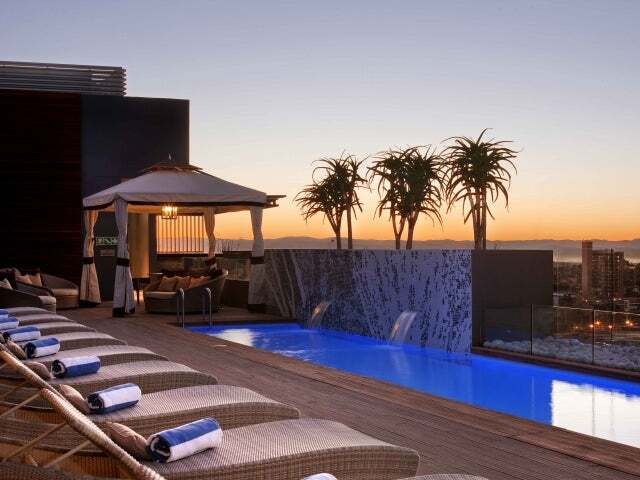 The rooftop bar of the gleaming, modern Hilton Windhoek is a pretty glorious spot in which to unwind with a drink. The rooftop bar of the gleaming, modern Hilton Windhoek is a pretty glorious spot in which to unwind with a drink. Located right next to the hotel’s swimming pool and surrounded by wooden decking spotted with chic yet comfy white recliners, the bar boasts some stunning panoramic views over the city. It’s a brilliant place in which to chill out by day, reclining with the sun on your skin, but come evening and the Sky Bar undergoes something of a transformation from a restful pool bar into a stylish cocktail lounge and social hotspot. As the sun sets you can sip your drinks – a cocktail perhaps or a glass of crisp white wine – and soak up the dramatic views while relaxing to a soundtrack of chilled-out, ambient music.